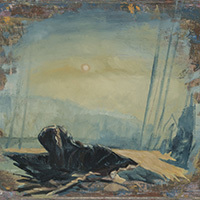 ‘Theaters of Fiction' at Ruth and Elmer Wellin Museum of Art at Hamilton College is a group show featuring EFA Studio Member Artist Rhona Bitner. On view February 16 — June 9, 2019 in Clinton NY. EFA Studio Member Artist Katinka Mann is having a solo exhibition, “Moving Through Stellar Space” at Gallery Max Soho in New York City from March 8 to March 28, 2019. Work from 1996, 2010 and 2017 will be shown. EFA Studio artist Dana Levy's exhibition, "The Weight Of Things" at Fridman Gallery was reviewed by WHITEHOT MAGAZINE. 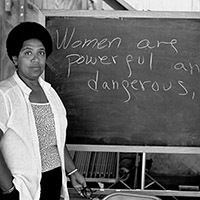 EFA Project Space public events this week feature OlaRonke Akinmowo's The Free Black Women's Library, a viewing and reception organized by Christen Clifford with the Feminist Art Project, and a special post-Valentine's day reading with author and critic Jennifer Doyle. EFA Studio member Dana Levy’s video installation 'The Weight of Things' will be on view at Fridman Gallery from January 16 - February 13, 2019. The piece depicts rooms of the Palace of Versailles in the midst of an earthquake. EFA Studio Member Artist Vicky Colombet's exhibition, "Paintings from 2007 – 2018" has been reviewed by The Brooklyn Rail. The exhibition is presented at The Elkon Gallery from October 18th through December 21st, 2018. EFA Studio artist Bryan Whitney will be giving an artist talk at the main branch of the famed New York Public Library on 5th Ave. in Manhattan on Wednesday, Sept. 26 at 6:30 pm. Topics covered will include his 360/VR spheres and a new 360 video of Indian Stepwells. 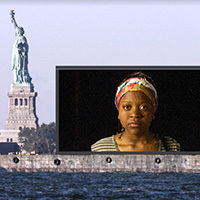 EFA Studio Member Artist Shimon Attie's public art project "Nightwatch" gets a thoughtful write-up in a New York Times article "Cruising New York’s Waterways This Week: Portraits of Former Refugees" (by Sopan Deb, Sept. 24, 2018). "Nightwatch" a public art project by EFA Studio Artist Shimon Attie is on view from September 20 to 27, 2018. Night Watch will be projected on a LED screen mounted on a barge, and will be viewable from 6PM to 10PM for eight days, during the 73rd United Nations General Assembly. EFA Studio Member Artist Toyin Ojih Odutola opens her fifth solo show "When Legends Die" at Jack Shainman Gallery September 6–October 27. A Solo exhibition "Permutations" by EFA Studio Member Artist Tamiko Kawata is on view at Garvey Simon Gallery from September 6 to October 6, 2018. EFA Studio Artist Amy Hill is having a solo exhibition, "Back to Nature," at the Front Room Gallery in Williamsburg, Brooklyn from Sept. 5 until Oct. 21, 2018. Andrea Burgay released Cut Me Up, a participatory magazine of visual call and response, published through Specious Arts. Each issue presents a “call”—a curated selection of original collage images that will become raw material for reader-artists to “respond” by cutting, reconfiguring, and transforming them into new artworks. EFA Studio Member Park McArthur will be participating in the Carnegie International, 57th Edition, 2018, which runs October 13, 2018 - March 25, 2019 at Carnegie Museum of Art. EFA Member Artist Alexander Schweder is highlighted in The Brownstoner for his piece "ReActor" installed in the Fields Sculptural Park at Art Omi. EFA Studio Member artist Greg Kwiatek is the recipient of at 2018 Adolf and Esther Gottlieb Grant. In celebration of video artist Nam June Paik's birthday, Member Artist Saya Woolfalk will be giving a free lecture at the Smithsonian American Art Museum in Washington, DC on July 22nd from 4-6pm. As part of her exhibition "El Dorado (The Golden)" at the Lewis H. Latimer House Museum, Member Artist Cecile Chong will be leading a free art making workshop on Sunday, July 22nd from 3-5pm. All ages and families are welcome to join. The installation will be on view until October 14th, 2018. 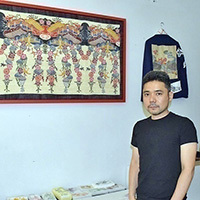 EFA Member Artist Yuken Teruya is featured in an article by Yukiyo Zaha in The Ryukyu Shimpo (Okinawa newspaper) on July 4th, 2018.